What did the Lib Dem manifesto in 2005 propose? I asked myself the question when reflecting on the legacy of The Orange Book 10 years after it was published. I remember Paul Marshall, the book’s co-editor, dismissing it at a Lib Dem fringe debate a couple of years ago as a combination of unrealistically high spending commitments and “bribes” to constituencies such as students. He read out the list of 10 pledges around which the party’s election campaign was framed, and I recall there was an uncomfortable shifting in seats as even those not particularly keen on The Orange Book realised he had a point. Individually, most of the policies are defensible. Collectively, it’s shockingly unambitious. A bit more money here, some more staff there, and don’t worry you won’t have to pay an extra penny in tax. In fact, almost everybody will be better off. Let’s remember, this was just two years before the financial crash which almost totalled the entire British economy. If it lacks all credibility with hindsight, it suggests the party was lacking some foresight as well. And I say that as someone who was devoting almost all my non-working leisure time then to campaigning for the party and is therefore complicit in it. For those tempted now to look back on the Lib Dem glory days of 2003-05, when we mopped up the anti-Labour protest vote while the Tories were still down-and-out, it’s a salutary reminder quite how complacently lazy much of our policy development was at the time. The Orange Book helped wake up the party, stimulating a much better quality of debate across the spectrum of views. Without The Orange Book, it’s doubtful we’d have the Social Liberal Forum. Without SLF, Liberal Reform wouldn’t exist. I like dialectic in political debate and the challenge and counter-challenge which often (not always, but often) ratchets up standards. 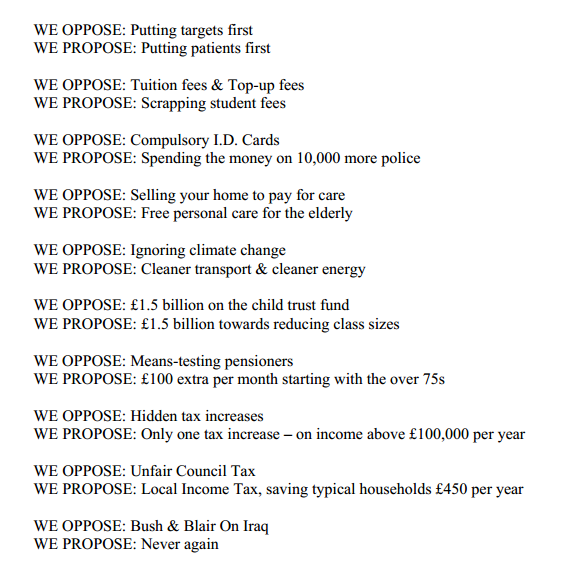 Certainly it gives me confidence that our 2015 manifesto will be a marked improvement on its 2005 version. Bit harsh to say that "this was just two years before the financial crash which … suggests the party was lacking some foresight." Nobody saw the financial crash coming – not even (despite some Lib Dem re-writing of history) Vince. But otherwise I agree that it was a woolly set of pledges that mostly can be summed up by saying "We'll spend the same amount slightly differently, plus raise a surprising amount from a tiny proportion of the population which will pay for all sorts of goodies. Oh, and no-to-war!" Our 2015 manifesto has a chance to really be ambitious. In light of our present travails, I can think of no alternative to that ambition. Wasn't suggesting we should have seen the crash coming. But we did know Labour had already splurged on public services, yet our liberal response at the time was to say "And a bit more will make all the difference". Didn’t that manifesto and the leadership of 2005 produce the best GE result for the LibDems/Libs in living memory? I wonder if the the Orange book influence in 2015 will attract any votes, I some how doubt it. Fair enough, but the above-quoted sentence does imply otherwise. As has been commented on Facebook, this whole piece is based on a false premise; that the rather silly list of 10 items was part of the manifesto. It wasn't; it was imposed by the 'communications professionals' over FPC's head. I was there at the time so am well aware. What was agreed as being absent in 2005 was an overarching narrative. It was absent then and is absent now. I joined this party because of the 2005 General Election Manifesto. It had many good centre-left policies in it. Although I agree, the leadership could have given a better social liberal narrative. Moving more towards the Orange Book in 2015 would be an awful mistake. We must be a distinctive radical party, not the yellow brand of Thatcherism. Hi Stephen – a thought-provoking article… By which, um, I mean that it provoked me to answer back at such length that it would be ludicrous as a comment here. So I’ve written an open letter to you instead! Summary for the tl;dr type: tl;dr is a very poor foundation for critiquing two long documents. Well done Gareth….somewhere down the line (although I don't think it was in the manifesto), I recall the then leadership actually talking about a "real" mixed economy and re-nationalisation of the ralways…..East Coast seem to be doing OK ! Notwithstanding what Gareth said, At most 6 of those 10 are spending commitments. Two of those are pretty direct virements from one item to another (so not a spending growth item). Of the other you have Fees, Care, Green stuff, pensions. Three of those made it into the 2010 manfesto as spending commitments – as did the idea of spending growth on education. And looking at the party’s summer campaign pack spending on green stuff, pensions and education is going to be in the 2015 manifesto.